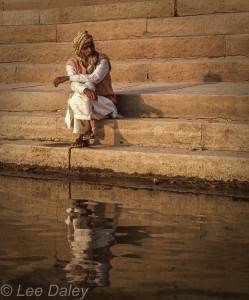 The spiritual capital of India, Varanasi rests on the most sacred stretch of the Ganges. Sanctified by Shiva’s eternal presence, the “City of Light” is foremost among the 12 sites where the god burrowed and then burst into the atmosphere in a brilliant column of light. Leading up from the river, about 90 broad steps known as ghats are backed by a cliff-like array of temples, shrines and towers. 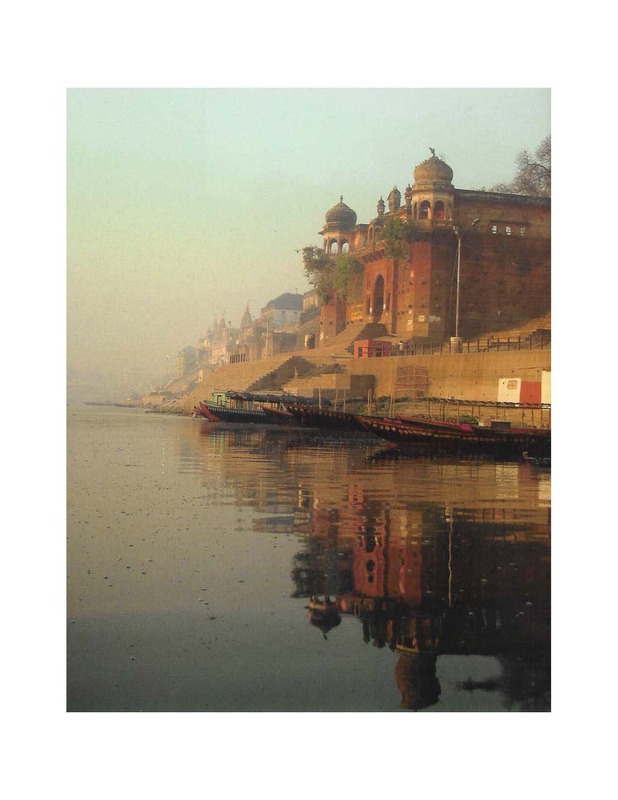 Because Varanasi is situated along the western bank of the Ganges with the river flowing south to north, daybreak dawns dramatically to the east where fields and trees embrace the first light of day. As the sun rises it casts a golden glow on the holy waters and the bathing ghats, eventually warming the temples and shrines above the steps while the sky shifts color from pink to purple to blue. At the same time, a priest performs a thousand year old ritual called aarti, In a daily rite of consecration to the sunrise he repeatedly hoists a flaming brazier skyward. The flames signify purification. Take your time to meander along the ghats and you’ll soon find every ghat has its own story, its own ambience. 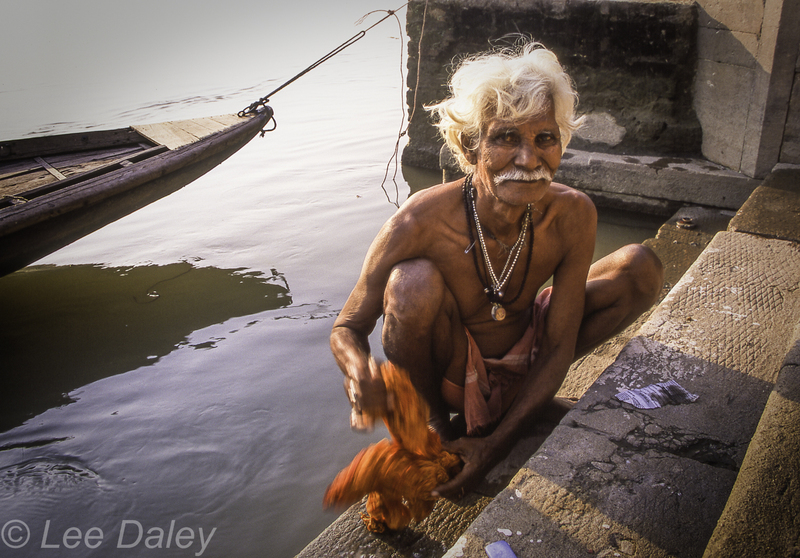 Nearby, local boatmen offer leisurely boat rides that keep a polite distance from the faithful who line the ghats and bathe in the waters. 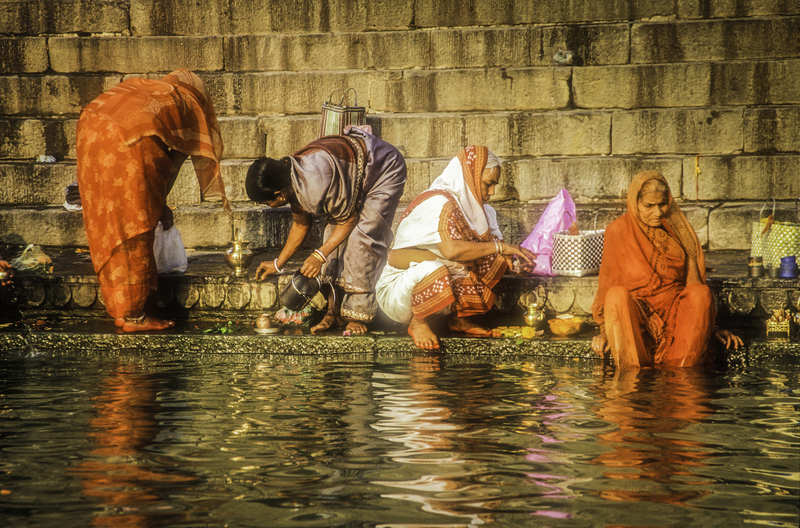 Devout Hindus religiously take a purifying dip with their morning prayers before beginning their day’s work. The scene often inspires a sense of spirituality in even the most jaded. It’s a timeless setting, a living fresco. Here too is where the living come to seek the blessings of Shiva and Mother Ganga. At the end of life, many travel to Varanasi to spend their last days, a tradition marking transition into another stage of being. Muslims believe that ending life in Varanasi offers moksha, liberation from the cycle of birth and death. Varanasi, the beating heart of the Hindu universe, is said to radiate endless energy with the belief that a single dip in the River Ganges will wash away a lifetime of sins. Morning reflections on the Ganges. Taj Ganges: good travel desk, excellent service, delivers guests to the ghats for a boat ride on the river. India. Visit India tourism information at: www.incredibleindia.org. Spectacular images – and heartfelt, almost alluring descriptions. Brava!